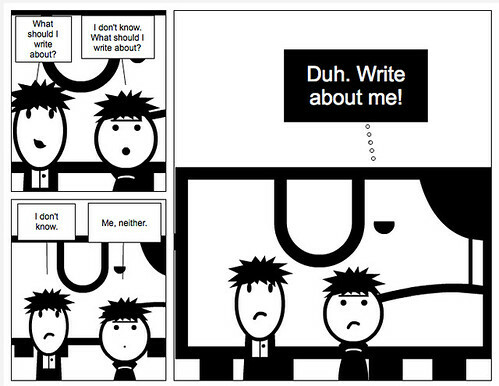 Here’s a comic I never had to use during this month of daily Slice of Life writing. I had even another comic sitting on my iPad, a Seinfeldian comic about writing nothing … just in case that day came and I had nothing to write about. But you know, I always found something to write about, and so did dozens of other educators and writers participating in the Slice of Life. I had no interest in the various prizes for commenting and posting, but if it kept folks involved, I’m OK with that. For me, the gift was that of connections, and writing. 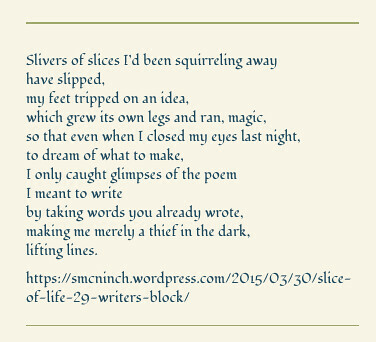 In a final nod to Slice of Life 2015, I went around yesterday morning and did some more of my “line lifting” — stealing lines from blog posts and then constructing short poems around them, as comments to the original bloggers. My aim, as always, was to honor the writing through some literary theft. You can read all of the poems I made yesterday morning here. You know, each March, I think … maybe not this year. Maybe I won’t take part in Slice of Life. Then, I do, and I can’t even remember why I was thinking of bailing out on it. There’s something in the collective power of teachers writing, sharing and connecting … expressing the good and the bad and the serious and the funny and the moments of our lives that reverberate across time and space. The writing exposes the human nature of who we are, and so many posts move us beyond our role of teachers. If you were a Slicer, or if you came here to comment at all, I thank you from the deep parts of my heart. If I never got to your blog to comment, I am sorry. I’m an early bird writer, so the blogs listed at Two Writing Teachers before school got my attention. Morning is my quiet writing time. Remember: We’ve still got Tuesdays. See you on the Interwebz. Yesterday was one of those literary convergence days, where a bunch of books I had been reading all came to an end, and then … I started a whole new bunch of books. 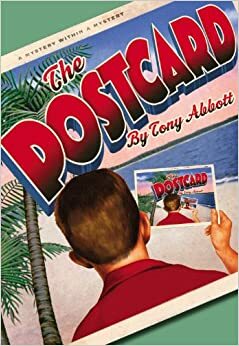 Book Read: I finished up a wonderful novel by Tony Abbott called The Postcard. It is a mystery story with a few layers of story going on, as a young boy discovers a postcard that opens up the truth about the mysterious past of his grandmother and his great-grandfather, with hidden stories uncovered by clues in found postcards. The Florida setting really helped tell the story here, and the intertwining narratives of the protagonist and that of the chapters of a short story that he finds weave together nicely. 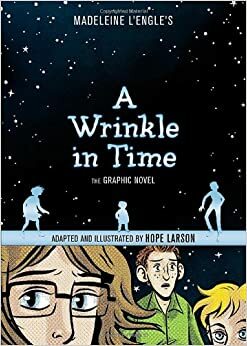 Book Begun: I’ve been wanting to read A Wrinkle in Time with my son for some years but I know it might not interest him in the way it grabbed me as a kid. But a graphic novel version? That worked, and after reading a bit last night, he took the book to bed with him to read it alone. I guess I am all right with that. Not really. I wanted to read it with him, and remember why I fell in love with the story of Meg and Charles Wallace and the adventures through strange time and space. I guess this one may move into the “pleasure reading” category soon enough. By the way, the graphic novel version is well done. 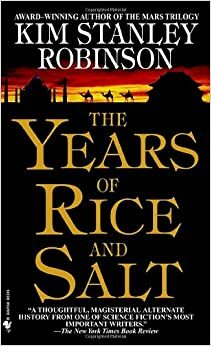 Book Read: I pick up John Grisham novels now and then, just for the power reading of story and the mechanisms of a legal thriller. I won’t say his writing blows me away, but Gray Mountain does have a deep theme to mine, with a New York lawyer volunteering in a small Southern town, and launching into a fight against the coal companies whose greed and corruption impacts the poor people of the communities where the operations take place. 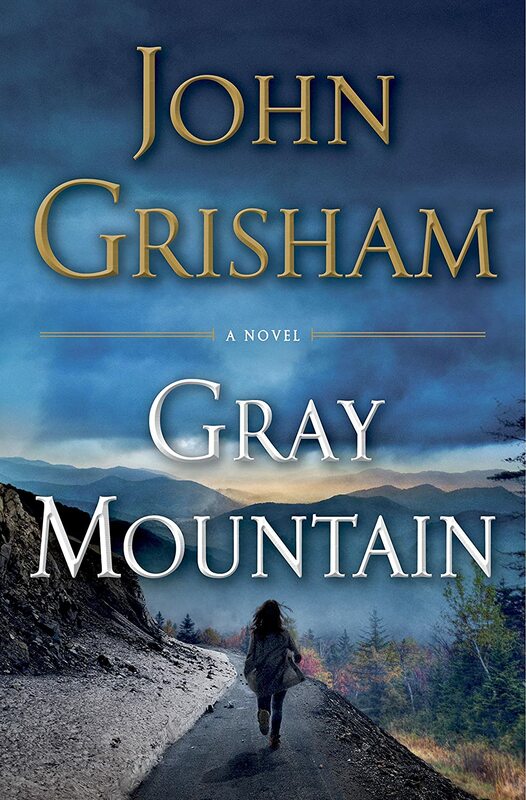 Grisham uses his novel to make a point about the destruction of mountain with clear cutting, mineral stripping operations that have ripped the tops of mountains off and left the majestic beauty of some places forever harmed. 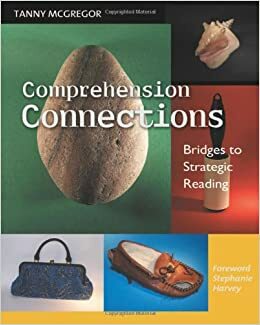 Book Read: I’ve been reading Comprehension Connections: Bridges to Strategic Reading by Tanny McGregor with a group of reading teachers in my school district. It’s part of a PLC that takes place during professional development days. I really like McGregor’s style of writing and of teaching, where she uses a lot of props and objects to spark understanding of concepts like inference, schema and synthesis with students. This was a good choice for our PLC gatherings, which continue this coming Tuesday. Book Begun: If you read this blog, you know I am always interested in the concept of gaming and game design for learning. 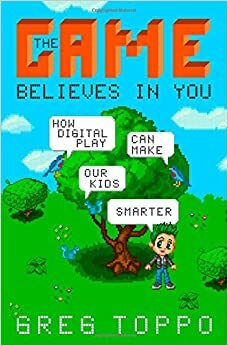 Greg Toppo’s The Game Believes in You: How Games Can Make Our Kids Smarter is a deft account of how game elements can engage students on a different level. While Toppo so far seems to be exploring the gamification idea, I am hopeful he shifts into putting the tools of design into the hands of students, which is my primary focus. We began with half-sized portions off the dinner menu, with a turkey burger (yum), a salad (yum), and some bbq steak sandwich (not yum). We used ipods to give our impressions, and then the leader of the market session led a discussion. When we got to the ice cream part of the night, we were all giddy and ready … I mean, free ice cream? … but after the fifth cup of ice cream (small portions, true, but they were all sundaes), I was ready to retire from the ice cream business. But then a sixth cup came. And then a seventh. Ten cups of ice cream to be consumed after a long day at school, and the adults around the room were all in a bit of a sugar rush. 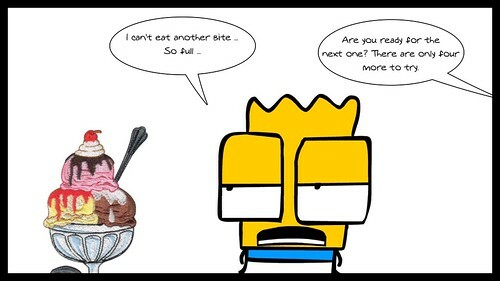 There were some good cups to taste (anything with peanut butter is OK with me) and some not-so-good ones (one blue ice cream had cake bits in it, with sprinkles and other gooey things and it was if someone dumped a cup of sugar down my throat … gross). It was definitely an interesting experience to be a Professional Taste Tester for a night but I am going Ice Cream Cold Turkey for a stretch. I’ll probably change my mind when the warm weather finally arrives. When is that, exactly? 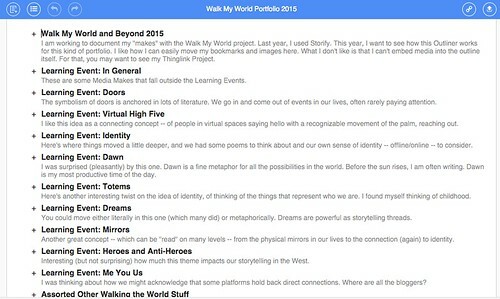 For the past several weeks, I have been intermittently involved with the Walk My World project, which is a series of learning events designed around reflective practice on the themes of identity, composing with digital media and connected learning. It’s been a blast, and I appreciate the work and support that Ian and Greg (in particular) do to invite people in and keep them active in the Walk My World spaces. I’ve mostly tinkered around in the #walkmyworld hashtag. And now, as we near the end, we are asked to consider pulling together our various “makes” and reflections into a single digital portfolio. Some folks are using Storify, which I used last year, but I wanted to keep trying out the Diigo Outliner tool and dig into something new. It’s merely an online collection of links and notes, organized in an outline format, which can be shared out. Check out my Walk My World digital portfolio, organized by Learning Events and assorted categories. On one hand, I like the organization of this Diigo tool. On the other hand, it seems rather bland as an experience. 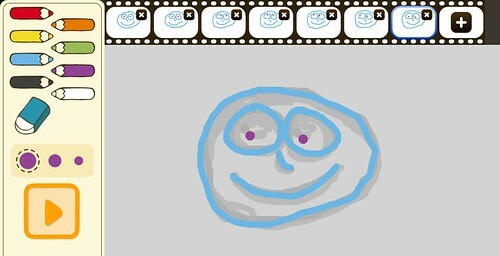 I’m feeling mixed about it, particularly when you consider how best to share a range of digital media projects. In many ways, if I were doing this right, I would create a website, linking and embedding media right into the experience of the reader (that would be you). With this tool, you need to follow my links out, moving into different spaces to experience what I made. I have been curious about the live-streaming video app called Meerkat. It’s pretty simple to use. Download the app. Hit the play and you are live on Twitter and the Web. I guess Twitter itself is nearing a launch of its own app — Periscope, I think it is called — but I wanted to try out Meerkat myself. 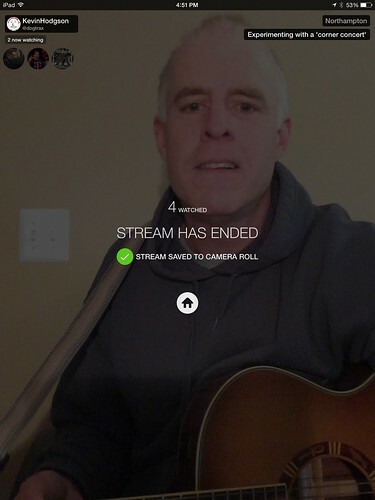 So, I figured, maybe I will play and live-stream a song. I have this idea for “corner concerts” — short, one-song streams of playing live for a few minutes, maybe on a regular schedule, and see if anyone cares to listen. I set up my iPad yesterday, grabbed my guitar and hit the play button and … well … played a song of mine, called Ease Your Mind. It was interesting because for the first part of the song, no one was watching. Little icons pop up in the corner when folks have opened your live-stream video. Then, I started to see a few visitors (in the video, you can can see me look at the screen and smile a bit), so I extended the song an extra verse and chorus before signing off. Meerkat saves the video to your device, so I uploaded it into YouTube easily enough. I’ll keep tinkering and playing around, and thinking about the possibilities of your mobile device being a live-stream possibility (good for conferences, maybe?). Thanks for reading. And if you were one of the icons in my stream, much thanks. Some things we take for granted in life. Like, hot water. By night, when my wife was using some hot water and the noise seemed like some monster living in our basement, I finally grabbed a flashlight to get a closer look. The water heater was banging away on the wall and a small drip of water was coming off one of the hoses. The floor was wet. There was a faint smell of something electrical in the air. We unplugged the whole shebang, called the plumber (who promptly returned our call at 8 p.m. and is coming over today — we love our plumber! ), and began to fret over the fix-it bill. This morning, I did a cold shave with freezing water — it reminded me of my time in the military, out in training in the woods, where the only water for shaving and cleaning was cold canteen water.